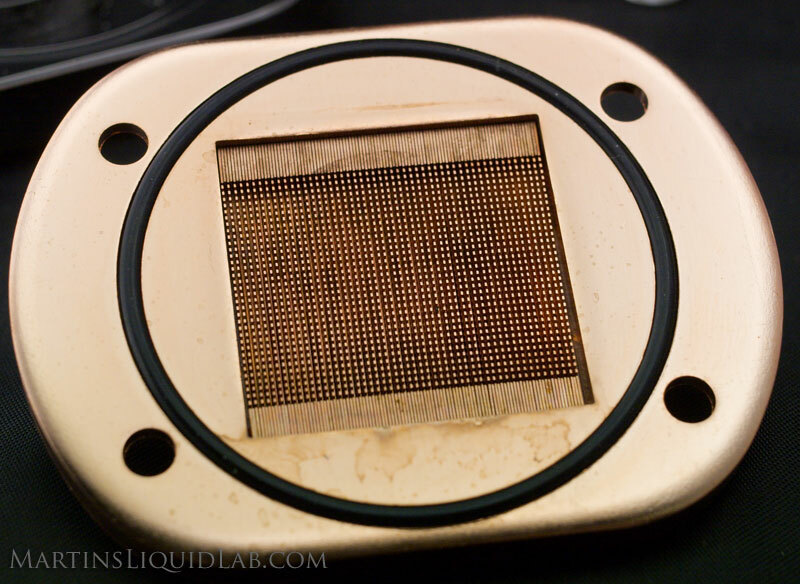 Welcome to my pressure drop testing of the Thermalright XWB-01 Waterblock for processor. 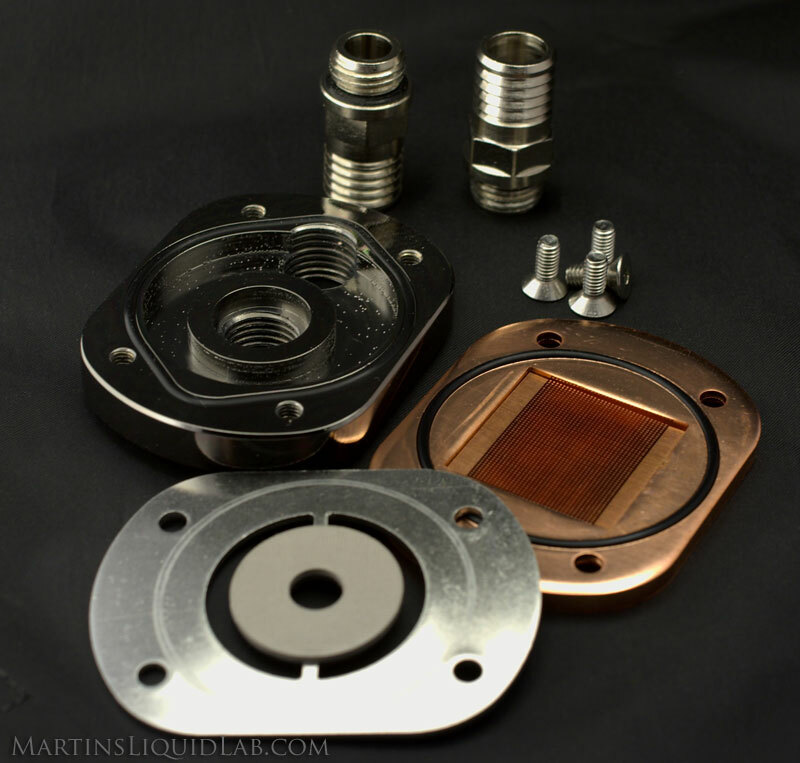 This page will focus on the pressure drop and flow characteristics only for this water block only. I will follow up at a later date to assess thermal performance when I've completed construction of my die simulator testing setup. The block is an all metal construction block that with a micro pin style design that include a chrome plated brass machined top, a punched and pressed chrome plated steel hold down plate, a punched steel mid-plate, and a punched/machined copper base with an micro-pin insert. The block packaging is done in Thermalright's typical brown box with black letter packaging and the block itself is nicely packages in solid foam to prevent damage during shipping. I was very pleased with the package, personally I prefer the brown box (less wasted cost on something getting recycled anyhow). And look here, it comes with a back-plate!, barbs, hose-clamps, and the necessary screws. Unfortunately the back-plate is not a stud type, it is a front loading type that will require motherboard removal during maintenance removal. You could however modify the mounting screws by replacing them with studs, plastic nuts, and waters and still utilize this back-plate in a normal stud system that would allow future access without removal. It's also nice to see enough thermal grease for the next 10 years worth of applications, that's a lot of "thin line" applications. At first inspection I had thought the barbs were not G1/4 because the chrome coating on the threaded top was very tight for D-Tek barbs, but after appling a little more force with some DD high-flow barbs, they did thread right in there. The stock barbs are a bit smaller on the inside diameter, although the primary contribute to restriction is going to be the pin matrix. The stock barbs do have nicely retained o-rings which is a very welcome sight. 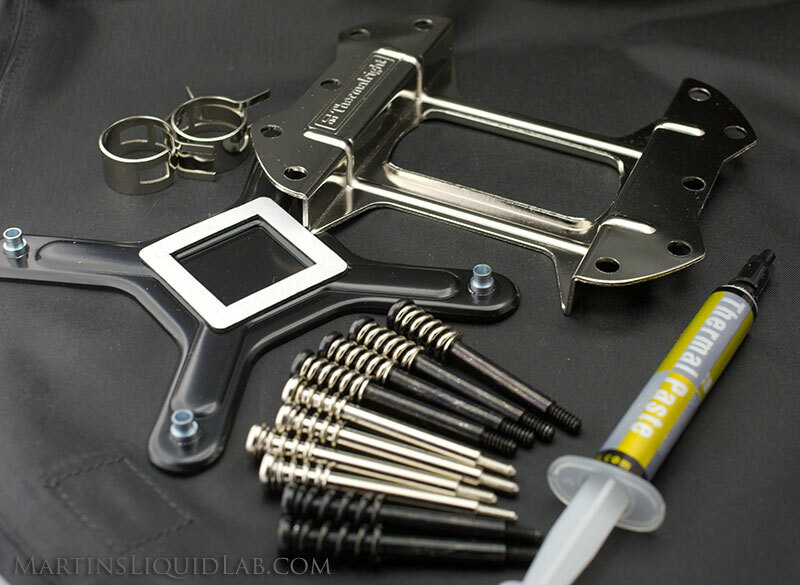 Hopefully thermalright will considered opening the ID of their own barbs to a nice 10.0 or 10.15mm ID to match other high flow options. The barbs are very nice other than the smaller inside diameter at the threads. One thing I noticed is the chrome coating on the brass top appeared to have a lot of tiny little chrome bubbles on the hidden interior. This shouldn't have any effect on performance, but it caught my attention. The copper pin matrix appears to be manufactured separately as you can see it's not perfectly aligned with the square socket that it sits in. Upon closer inspection you can see trace amounts of solder around the perimeter and I suspect the pins are actually punched from thin sheet metal copper material and stacked together to form the pin matrix which is then soldered into place. This is a clever way to manufacture a micro pin matrix at a low cost, but it does introduce a solder interface between the two pieces of copper which may not transfer heat as well as a solid machined, cast, or forged copper construction. In the end it is a nice micro-pin base, the pins are very very fine (one of the finest I've seen). The pins are hard to measure, but visually appear to be around 2-3mm tall. The mid-plate and mid-plate washer forces water appropriately down into the pin matrix and out radial in direction to the exits slots that return water to the outlet port. I anticipate these design features add up to a very well performing block. And to get a better sense of restriction comparison, here it is with several other curves. It follow very closely to that of the EK Supreme and somewhere between the 4.4 and 5.5mm nozzle with the fuzion. With both water-blocks and radiators there is always a game of tradeoffs between restriction and thermal efficiency. More restrictive blocks tend to incorporate nozzles or very fine pin matrixes or combinations of the two that simply cause some restriction to gain higher water velocities and turbulence which assists with improving thermal performance. This design has chosen to follow a more restrictive path for improved thermal performance, they don't necessarily go hand in hand, I just wanted to say it's a fair tradeoff when it comes to water-block and radiator design. I would simply suggest that you plan out your system more carefully with high restriction items. High restriction blocks go very well in single block loops because any impacts to flow rate have no effect on other blocks in the same system, only the radiator which are generally very resilient to flow rate impacts. I would recommend due to this higher restriction that you simply check flow rate on a designed system and ensure 1GPM is maintained. This is a good rule of thumb flow rate point where gains beyond mean less than a couple of degrees. 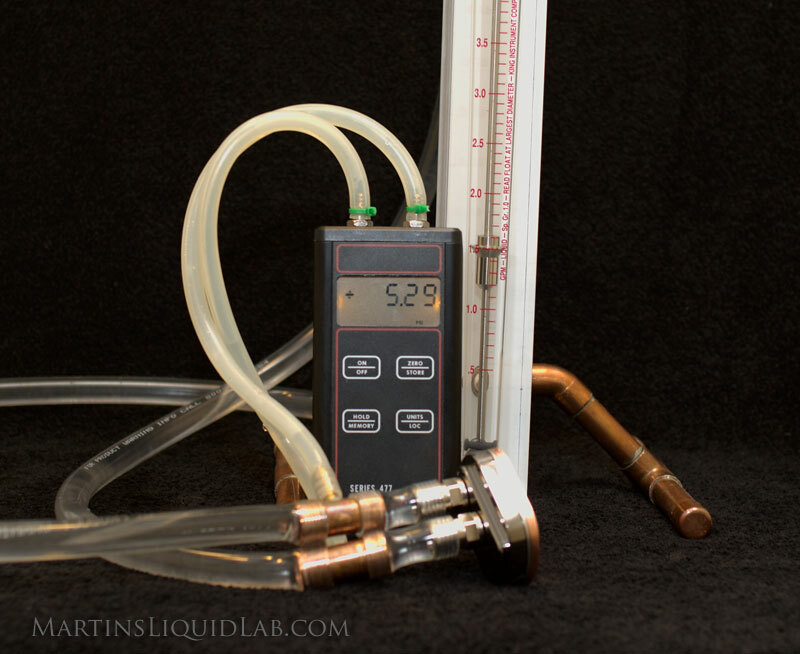 Until I've completed my own thermal testing, I thought I would provide you a link to thermal testing provided by the good folks over at Hardware Canuks. Their results indicate the block does perform well and similar to an Apogee or stock Fuzion on a quad core. 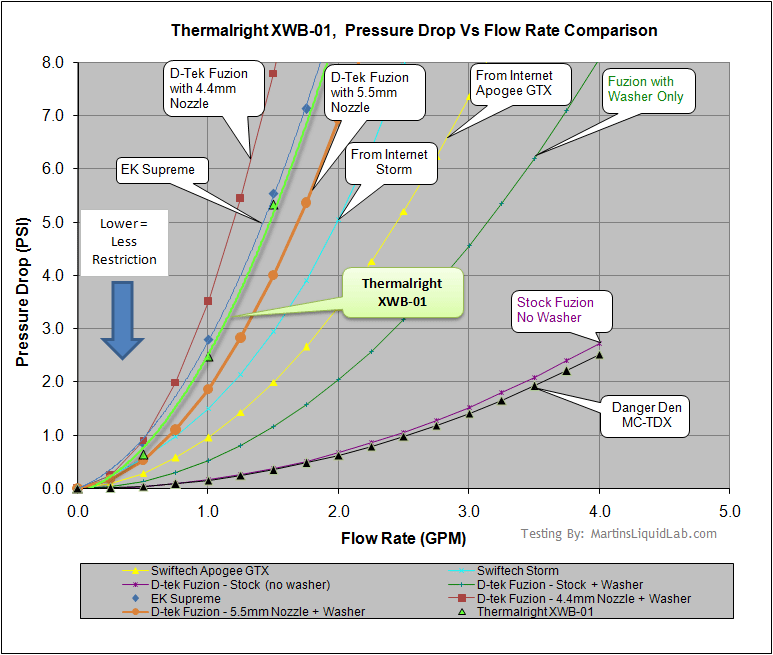 Unfortunately there was not a comparison with a Fuzion in full fighting nozzle gear or an EK supreme that would more closely match the restriction the Thermalright block produces. Typically I've seen users report approximately 2-3C gains with a nozzle/washer on the fuzion, so it would be a tough race for the top. 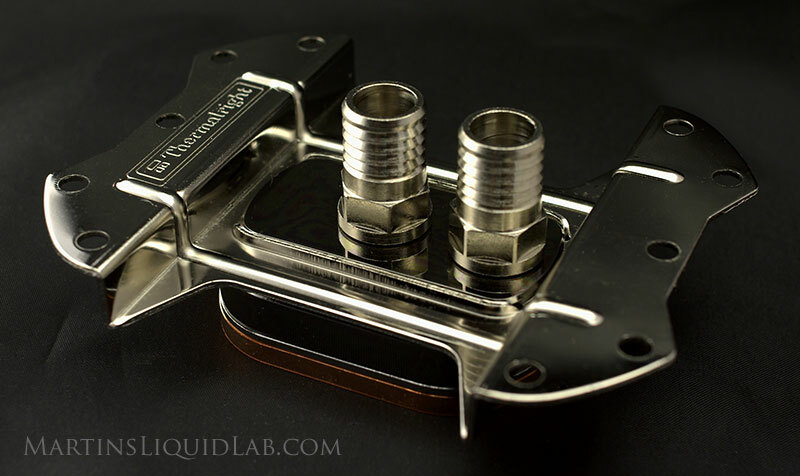 Regardless, this is very good thermal performance and considering Thermalright's track record for dominating the heat sink market, I'm not surprised to see it perform so well even if it is one of thermalrights first water blocks. Can't wait to see what they have up their sleeves next. 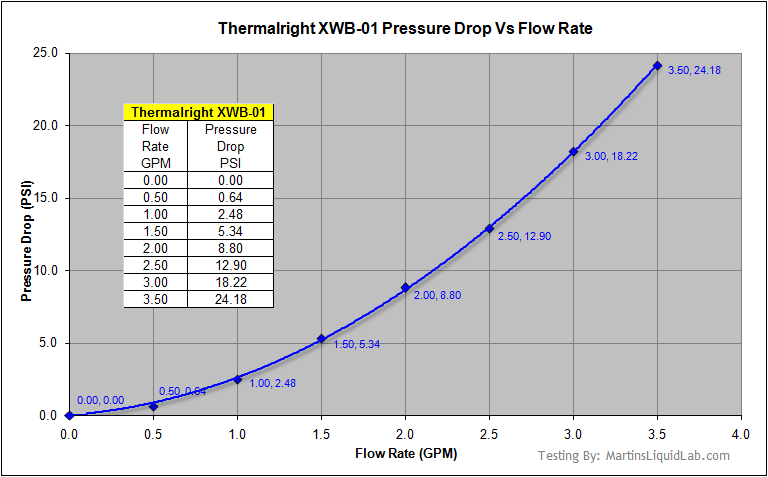 Considering the inclusion of the back-plate and all metal construction, that makes the Thermalright XWB-01 a noteworthy price competitor as well. The Thermalright XWB-01 is a very well performing nozzle style block with an ultra fine micropin matrix!